The opening title lets us know right away that this is an ’80s film made in the era of Swatches, Nagel prints, and neon fonts–well before anyone even knew what a font was. The Tangerine Dream-like original score reminds us of how ’80s movies sounded. “Echo Park” drew me in for three reasons. The first is its co-star, Susan Dey. As a boy, I wanted to kiss the TV screen whenever Lori Partridge came on. As a teen, I made a point of seeing any movie that Susan Dey was in, even if it was dubbed into Spanish on KMEX. Reason number two is the film’s other co-star, Tom Hulce. To me, Hulce will always be Pinto from “Animal House.” Pinto was the straight-laced, virginal freshman who was thrown into the anarchy of the Delta House, where all his adolescent angst was wiped away in one alcoholic swoop. I got through junior high and high school knowing that if Pinto could do it, I could do it. The third thing that compelled me to see this film was the title itself: Echo Park. Echo Park is a venerable neighborhood of Northeast Los Angeles, nestled into the low hills between Silver Lake and Dodger Stadium. In full disclosure, I spent part of my childhood in the ’70s near Echo Park. One of my good friends in 5th and 6th grade lived there, and a group of us would often ride the school bus home with him in the afternoon. After rummaging through his pantry for junk food, we’d walk over to Dodger Stadium to catch a ball game (In 1977, bleacher tickets for children 12 and under cost 75 cents!). Echo Park had been considered a gang intensive neighborhood for as long as I can remember (see Mi Vida Loca). Even back then, in 6th grade, my friend was facing situations I could scarcely comprehend: Teenagers jumping out of the bushes and demanding, “where you from, dood? Where you from?! ?” There was one 15-year old red-headed glue-sniffer in particular named Bernardo who was always in and out of juvie, and for some reason had it out for my friend. When you saw Bernardo, you just ran and didn’t look back. But Echo Park also had its multi-generational families, its mom-and-pop stores, and its faded grandeur that bespoke a certain historicity. The neighborhood dates to the 1880’s, which by L.A. standards is ancient history. The film industry itself was originally centered in Echo Park during the silent movie era, before World War I. Mack Sennett built what is considered the world’s first true movie studio there (Keystone Studios) in 1912. Many Laurel & Hardy, Charlie Chaplin, and Fatty Arbuckle comedy shorts were shot along the hillsides of Echo Park. 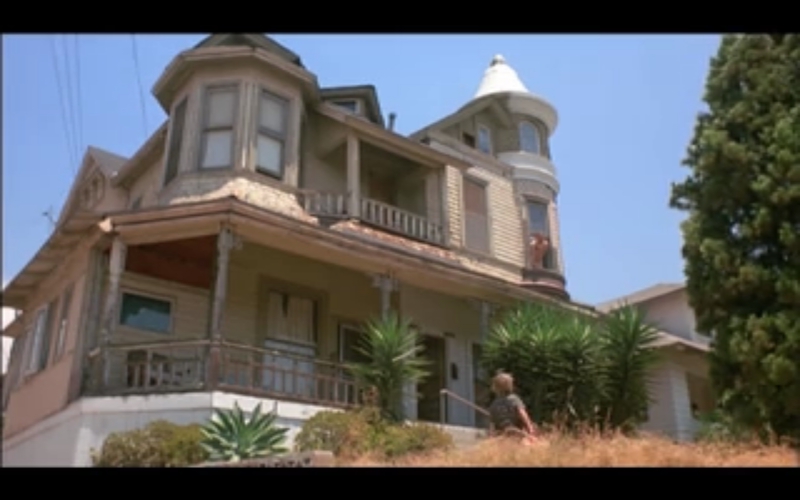 It is on these same hillsides, some sixty-odd years later, that “Echo Park” the movie takes place. Susan Dey plays May, an aspiring actress currently working as a bartender. Tom Hulce plays Jonathan, a songwriter and romantic who delivers pizza. And Michael Bowen plays August, an Austrian bodybuilder determined to make it in America. “Echo Park” opens with a dream sequence in which August’s father emerges from the Alps straight into Echo Park’s eponymous public park, wearing a garland of sausage links around his neck and leading a cow by a rope through a phalanx of zombie-like male and female bodybuilders that includes his son, August. “A good butcher uses every part of the cow, August,” the father responds enigmatically, brandishing a knife to stab not the cow, but a female bodybuilder who happens to be in the scene. August jolts awake in his bed with a terrified start from the nightmare. His demons now established, August steps out onto his little back stoop in the predawn to greet the new day. The palm tree affirms that we are in Los Angeles, and the lifeguard tower-sized room with sheets hung up for curtains indicates that it’s the kind of residence where a starving artist/body-sculptor lives. Back in his room now, August steps over to his workout machine and commences the day’s first sets of seated lat pulldowns with grim determination, punctuated by loud grunting screams that are open to interpretation. 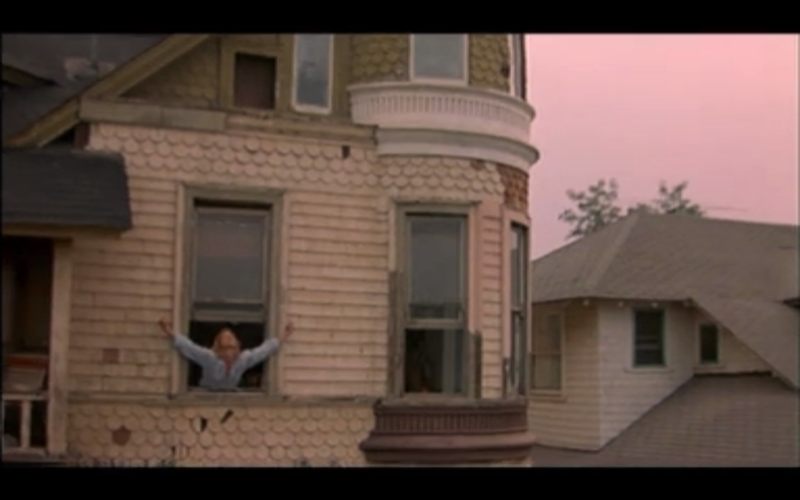 The camera next pulls back for an external shot, revealing that August’s pad is one part of the second story of a dilapidated house, the other part of which is occupied by May, who, wearing her nightshirt, flips on the light and presses her ear firmly to the thin wall to listen to August’s anguished grunts, and starts getting into it. Before May’s imagination can get too carried away, a little boy, her son, walks into the room and asks for a glass of milk. “At this hour of the night? It’ll just make you fart,” May answers, leading him back to his bed. The boy says he’s scared and asks May if she’ll lie down with him in her bed. “Sure,” she says, taking him to her closet-sized bedroom that has a curtain for a door. So far, so good. May is a single mom who has sacrificed any semblance of party life because she is devoted to raising her child. That’s why the next scene shocks me so. After tucking the boy into her bed, May sits on the edge and lights up a cigarette. I forgot that they used to do that in movies–have the sympathetic characters smoke in their establishing shots to show…what exactly? That they’re cool? Relatable? Responsible parents? Last but not least, we meet Jonathan, a pizza delivery guy out on the job. As a veteran of the pizza delivery profession in two different time zones myself, I can say with authority that Jonathan’s gig is like nothing I’ve ever seen. 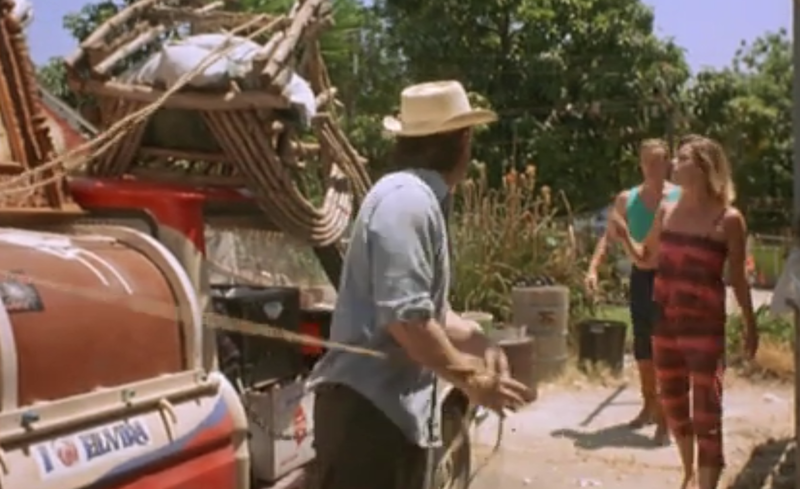 He gets to wear espadrilles, panama hats, and clothing that looks like it came right off the back of a field worker. That was how you slummed it in the ’80s, and apparently you got to slum it when you delivered for Vinnie’s Pizza. Jonathan drives a custom delivery truck that has no doors and surely can’t be street legal, and when he can’t locate the address of a pizza delivery, Vinnie tells him to eat the pizza himself if he has to, just don’t bring it back whatever you do. Is this thing street legal? “Quirky” seems to be the word favored by reviewers to describe this movie, and perhaps nothing establishes this depiction as well as the opening credits sequence, which is accompanied by a note for note cover version of the Sir Douglas Quintet’s “She’s About a Mover.” This enigmatically titled song is Tejano music rather than East L.A., but it has the low rider vibe of Echo Park. As the credits flash across the screen, we are presented with a montage of nocturnal Echo Park street scenes interspersed with footage of Jonathan on his pizza delivery rounds and an entire house from floorboards to rafters being transported in one piece on an oversized flatbed. Night turns to day as our main characters, who still don’t know each other yet, get busy with their morning commutes on the streets of Echo Park. “She’s About a Mover” reprises as Jonathan locates a pizza delivery address and discovers there’s nothing there but a vacant lot. He phones Vinnie the dark-personalitied pizzeria owner to report this news, and Vinnie responds, “Whaddya mean you can’t find the place? It couldn’t just disappear, unless there was a mover…” And voila. With that Delphic non-sequiter, the circle of quirky has just been squared: The Sir Douglas Quintet song, the house being transported by night, the vacant lot. It all ties together, or not. The film’s writer is Michael Ventura, who came from Austin, TX to Los Angeles, where he began writing for the alternative newspaper, the L.A. Weekly, in the late 1970s. If there’s anybody who would pick up on the special vibes of a place like Echo Park, it would be someone like that. Ventura’s Austin, TX roots might explain the selection of the Sir Douglas Quintet song as the movie’s establishing number. “Sir Doug” originated in the nearby Texas city of San Antonio, and its founding members were about four years older than Ventura, just the right age for a teenager to be out enjoying their shows, and to gain a lasting impression of their music. Echo Park. The house where the kisses are his and his and hers. Back to the plot development: Inevitably, Jonathan and May’s paths cross when he delivers a pizza to her door after she has had a fruitless day of interviewing prospective tenants to help defray her rent expense. Once again, the delivery process is like nothing I’ve ever seen. Jonathan knocks on May’s front door with the pie, but instead of completing the transaction there at the door, she points over her shoulder and says, “the kitchen’s that way.” Jonathan wordlessly finds the kitchen, slides out the cutting board, and places the pizza box on top. He then opens the box, procures a 99 cent store pizza cutter and begins slicing up the pie, making sure to pin down the crust with his unwashed hand for leverage as he hacks away. “Oh, you don’t have to do that,” May protests. “It’s part of the service,” Jonathan explains. But there’s method behind the madness. This sequence of events happens for a reason, three reasons actually: So Jonathan can develop a crush on May, find out she has a room to rent, and make an offer on the room himself. Bodybuilders on a mission, August front and center. Next we go to the gym to see August working his day job as a personal trainer. August trains his clients by repeatedly telling them in his Austrian accent that their muscles are puny. Keep in mind, this movie came out a solid year before Hans and Franz debuted on Saturday Night Live, so let’s give credit to Michael Bowen and the creators of “Echo Park” for developing this character first. 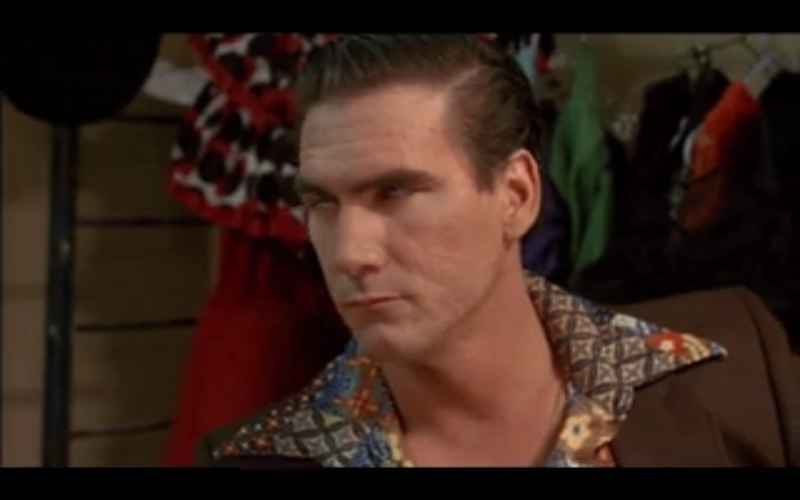 Bowen really did his homework for this role, studying all the Arnold Schwarzenegger footage to glean the future governor’s core ideas about muscles, orgasms, masturbation, superior genes, and celebrity, and mold them into an overarching narrative that became the character of August. The manager of August’s gym is played by Richard “Cheech” Marin, and the receptionist is played by Cassandra Peterson, better known to many as Elvira, Mistress of the Dark. By the 14-minute mark, the three protagonists in “Echo Park” are already in place. All that’s left to do now is watch the plot unfold and the characters develop. We see firsthand the ups and downs of May, Jonathan, and August as they struggle to tightrope across the gap between the dream and the reality, trying not to plunge into the insecurity roiling below. May attempts to strip-o-gram her way into legitimate Hollywood while maintaining her dignity and the respect of her son. The cynic in me suspects this role is just a ruse by the director to get Susan Dey to dress and undress in a series of tarty costumes. May’s foray into stripperdom introduces us to Hugo, a sleazy producer who operates out of an office on skid row. For my money, John Paragon’s rendition of Hugo is the best performance of the entire film. And don’t worry, Hugo may be dripping with slime, but underneath it all he’s got a heart of gold. Jonathan is the broodiest of the trio. He’s an intellectual who dabbles in songwriting, but spends most of his time in his book-lined bedroom or out delivering pizza. “Echo Park” does a very good job of showing rather than describing Jonathan’s failure to connect romantically with women. This would be a good place to note that the hearing of grunting through walls we experienced in the opening scene becomes a leitmotif throughout the movie that ties together all three characters and advances the plot. August and May, two of the hottest months in the calendar, discuss when it’s not ok to grunt. Throughout his workday, Jonathan occasionally hums an unrecognizable tune, but the only tangible clue of Jonathan’s songwriting ambitions comes when he delivers a pizza to a recording studio. As we know, Jonathan likes to make himself at home wherever he drops off a pie, so as the session band takes their lunch break, Jonathan noodles around on a keyboard and mumbles his way through the song he’s working on. “That has a nice feel to it,” the beer-gutted studio engineer says tenderly, looking up from his pizza slice. “Carry on; it’s good.” In the business, that’s called serious label interest. But as the guitarist steps in to pick up the melody, Jonathan explains that the song’s not finished yet, and makes a hasty, Cinderella-like retreat as the engineer begs him to come back. August’s dreams are more involved. He’s a go-getter who, unlike the other two protagonists, takes direct, pro-active steps to make those dreams come true. When Hollywood doesn’t cooperate with August, his demons emerge. Indeed, in the fullness of time, what redeems “Echo Park” is not its smooth plot, but its sincere effort to identify and portray the occasion of artistic-idealistic 20-somethings congregating in rundown but charming ethnic neighborhoods, where they share dilapidated housing in roommate situations, surrounded by local oddballs, haphazardly chasing the dreams that brought them to the big city in the first place. In the end, it is the journey and the interactions they have with each other that become the story, while the dream falls by the wayside. It is a storyline that is much more familiar in the ’90s, once Generation X becomes identified and celebrated in popular culture. Back when “Echo Park” was shot in 1985, no one knew what to call this phenomenon, but at least one team of filmmakers knew it was there and tried to say something about it. Watching the movie all these years later, I was immediately reminded of the ahead-of-its-time single from the musical duo David + David, “Swallowed by the Cracks,” off the “Boomtown” album, which happened to be released the same month (July 1986) as “Echo Park.” “Swallowed by the Cracks” tells the story of another guy-guy-girl team who chased their dreams to the big city and missed the bus, With lyrics like, “I had a girl and I loved her. My best friend was her brother,” this song seems to be describing the August, Jonathan, May triangle itself. if we just could get started. while Steve was a writer. Then Stevie ran away and got bored. Eileen got a job in a store. In the opinion of this blog, the thinness of “Echo Park’s” plot is trumped by the boldness of the statement it was trying to make. You may notice many irregularities in the way Jonathan delivers pizza. One is that he quotes prices in whole dollars, seemingly off the top of his head: “mmm…seven dollars American…” “uhh, ten dollars per pizza…” Even stranger is the total absence of “hot bags.” Jonathan just walks around trudging a stack of dented cardboard pizza boxes on his deliveries, but this might actually be historically accurate. Although hot bags were standard by the time I started delivering pie in 1989, apparently they weren’t in general use until Domino’s patented them in 1984. If this is the case, then the odds are good that “Vinnie’s Pizza” would be a late adapter. 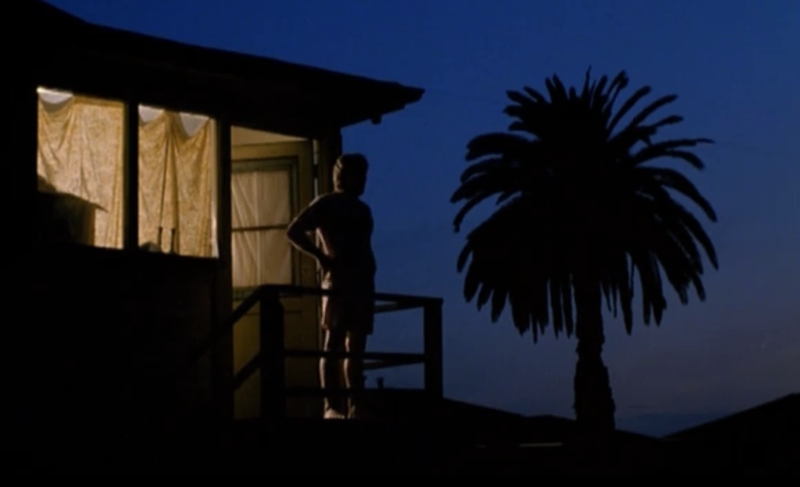 Though they are in East L.A. in summer, Jonathan goes the entirety of the movie wearing button-down shirts, long-sleeve shirts, or two layers of shirts, including on a day at the beach. Then, inexplicably, he goes shirtless for the last ten minutes of the movie, even though these scenes take place in the cool of the night and in the Austrian Alps. Perhaps it’s meant to symbolize the liberation of Jonathan’s character. My guess is Tom Hulce lost an off-camera bet with Susan Dey over who had to go shirtless. The film is bookended by a pair of intriguing sequences filmed in Austria that last about two minutes in total and have absolutely nothing to do with the storyline. Other than keeping it surreal, the most likely reason for including these scenes in “Echo Park” is to give the film the “Made in Austria” imprimatur displayed in the closing credits and thus secure funding from the Austrian Film Fund. “Amadeus,” of course, starred Hulce in the lead role, and was filmed largely in Vienna, Austria. 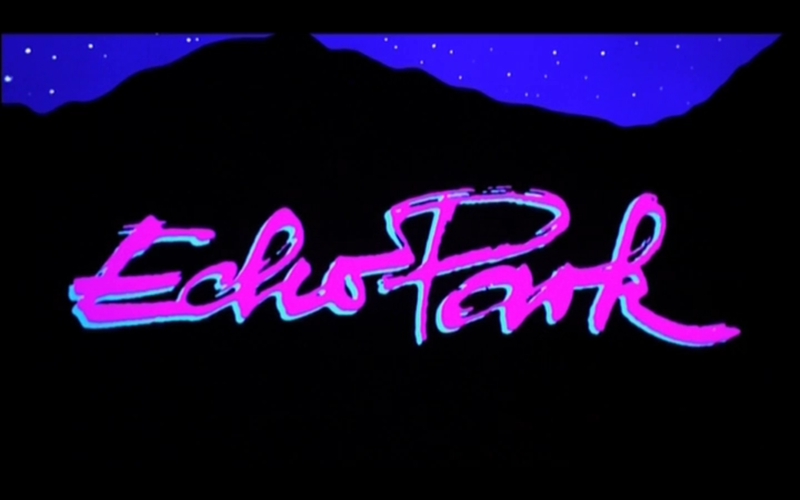 “Echo Park” appears to have been filmed in the spring or summer months of 1985, when Tom Hulce would have been at the apex of his “Amadeus” fame, just after that film in which he starred in the lead role triumphed at the 1985 Oscars. 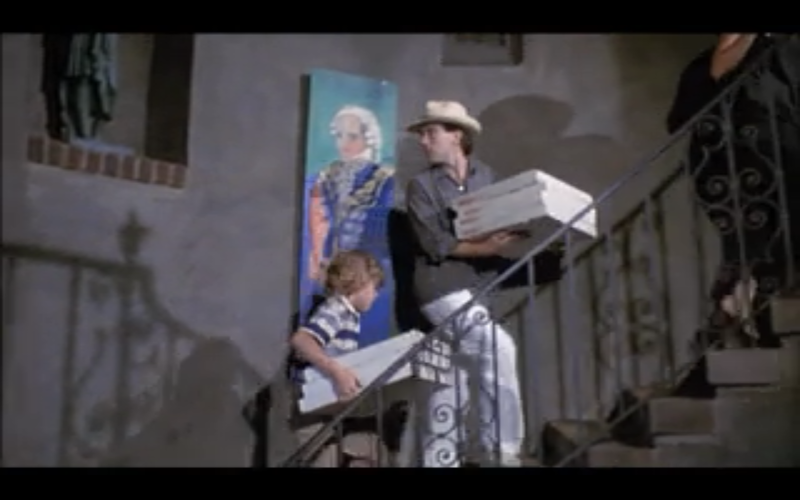 Yet, “Echo Park” grossed less than $800,000 in the U.S.A.
At about the 1:17:00 mark in the film, Jonathan (Tom Hulce) walks up a staircase, past a portrait of Mozart, and stops to do a double-take. When Jonathan moves in to May’s house (Susan Dey), he is carrying a stack of records, which includes a prominently displayed Partridge Family LP. Susan Dey, of course, played Lori Partridge. 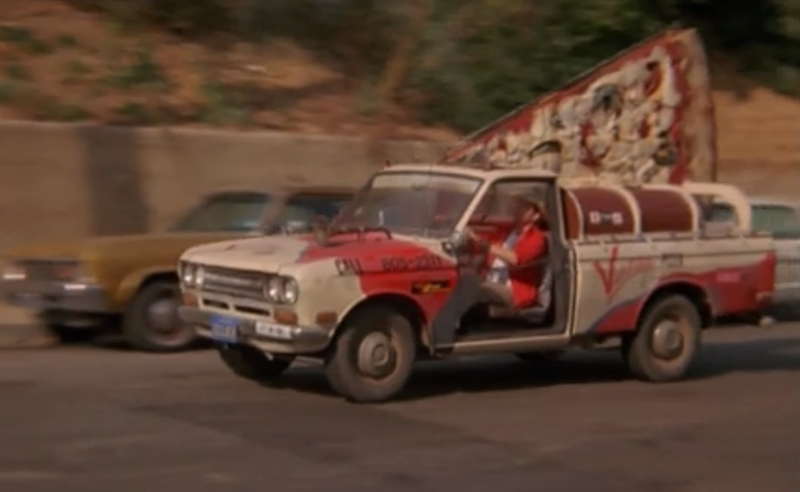 There is an “Elvira” poster on August’s wall, as well as an ‘I Heart Elvira’ bumper sticker on the Vinnie’s Pizza delivery truck. “I Heart Elvira,” lower left. 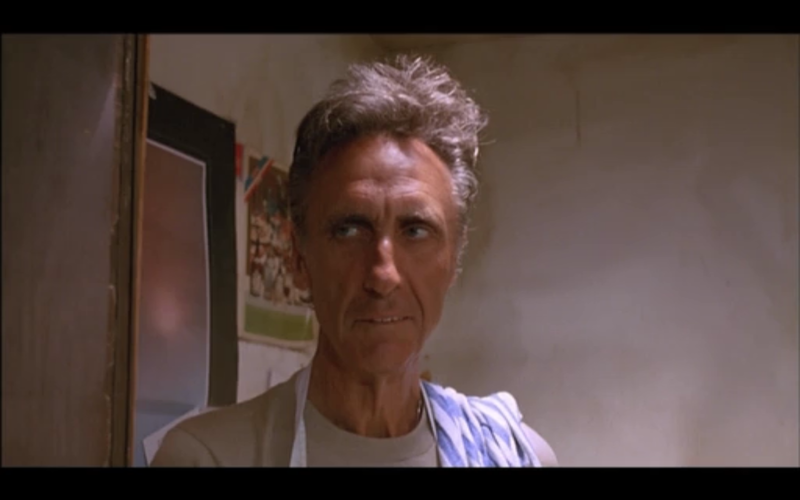 Vinnie the pizzeria owner was the final feature film role of character actor Timothy Carey. 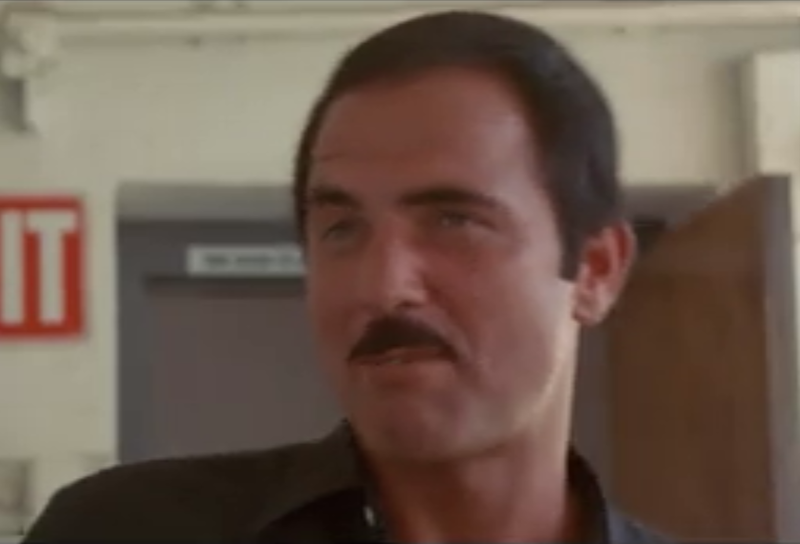 Burt Reynolds’ double is played by longtime colleague of this blogger’s father and all-around L.A. County renaissance man, Fred Leaf. Included in the film’s soundtrack is the song, “Tomorrow’s Gonna be a Better Day,” performed by “Johnette,” who is none other than Johnette Napolitano, longtime resident of Silver Lake (which shares a zip code with Echo Park), just before she formed Concrete Blonde. 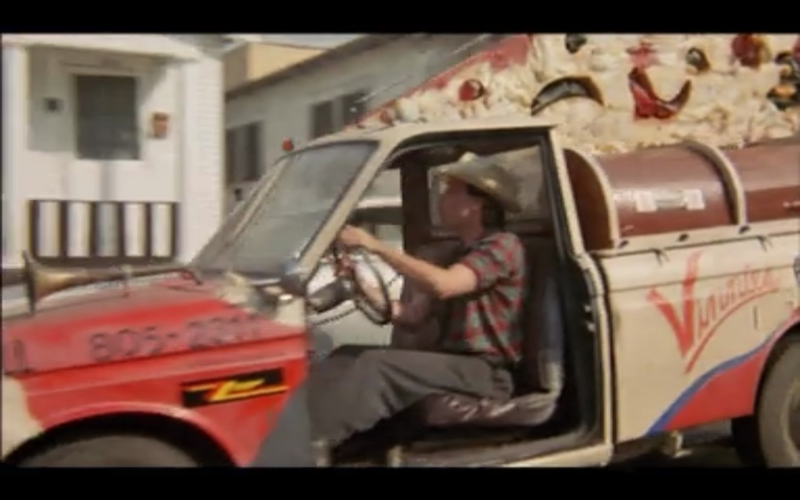 The song (sans vocals) can be heard during the climactic pursuit scene towards the end of the film, when Jonathan debuts his shirtless look. Also included in the soundtrack is “Imagination,” by David Baerwald, one half of the duo David + David, and singer/songwriter behind the aforementioned song, “Swallowed by the Cracks.” The film’s music (as per the opening credits) is by David Ricketts, the other half of David + David.